Mozart's Magic Flute with Tasteful Titles, June, 2018. 1/3 off for schools & small-budget orchestras! We were thrilled that the Cleveland Orchestra, after examining several translations, chose TastefulTitles.com for their Carmina Burana supertitles! Projected supertitles keep your audience in touch with what is happening in the music. Though disdained by a few purists, supertitles are immensely popular with a large majority of audience members. The best endorsement we have seen is this one by Henry Fogle, President of the League of American Orchestras. We provide supertitles as a PowerPoint (.ppt) file*, which you may edit if needed. Two-line text is rendered in font, white on black background. Black slides are included for orchestral interludes. A cued, loose-leaf, piano/vocal score is clearly marked for easy synchronization. Repeats are given in-line, so no turning back is required. We think our scores, with text and slide numbers printed above colored cue markers, are the clearest and easiest-to-use in the business. Carmina Burana's racy medieval text demands a judicious touch from the translator. Too direct, and you may risk offending patrons' sensibilities. Too restrained, and you may lose the earthy flavor. TastefulTitles' translation achieves a fine balance—never offending, but artistically preserving the sense of the original. Das Lied von der Erde, while not so ticklish as the Orff, also benefits from a tasteful translation. 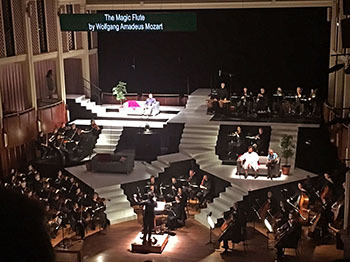 Magic Flute is our newest and largest project, created for the Indianapolis Symphony Orchestra. In addition to titles for all the musical pieces, translated from the German, we provide English for the dialog portions that may be spoken on stage, leaving the singing in German (with translated titles) and the dialog in English for easier understanding of the action. La Boheme is our magnum opus. We spent nine months giving it a fresh, modern translation designed for typical American audiences, who may not all be seasoned operaphiles. We don't think you'll find another that's as easy to follow and enjoy. Brahms' Requiem's text comes from Biblical scripture. Our translation primarily uses the clear, modern wording of the New Revised Standard Version, but we've made some adjustments where the NRSV differs markedly from the German. Requiems by Verdi and Fauré, and Beethoven's Mass in C, all use standard Latin text, which we've rendered in a formal-equivalence style translation, so that the words on screen correspond, when possible, to the text being sung. Need titles for a non-standard work? We will mark your score and create powerpoint slides from your digital text for $1.68 per slide, and you keep both cued score and slides! *Need a different format? Let us know—we can probably provide it!